As described under "Keyboard Customization" you can map the physical keyboard keys to any logical Primitive functions you desire. 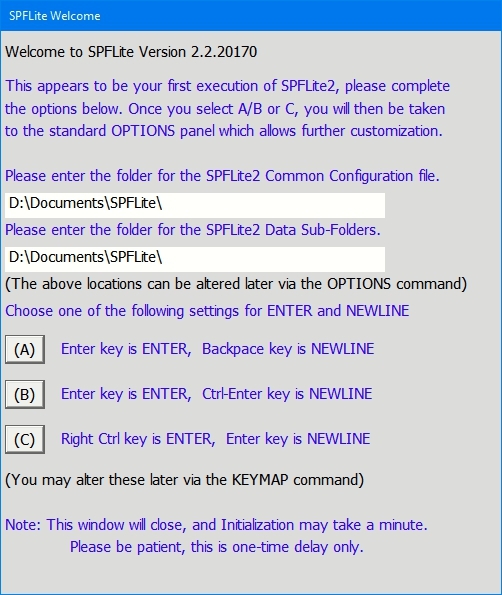 During the first execution of SPFLite following install, you are presented with a popup display and asked to choose between three different key assignments for the ENTER and NEWLINE keys. You must choose one of the options. If none suit your preference, you must still choose one to start with; you can immediately change these settings with the KEYMAP primary command. The initial assignment here is done to prevent SPFLite from setting defaults that you are not aware of. Since the particular choice you make is important, you may wish to make a note of it somewhere. Your choice above will then be included with the standard key defaults. SPFLite is installed with a standard set of predefined keys to get you started. Many users choose to immediately alter some of these to their own preferences. The predefined defaults reflect common usage in mainframe ISPF, PC-based ISPF emulators and text-mode Windows editors. Most users will find these defaults a useful place to begin. Why doesn't SPFLite just map every possible function to a standard set of keys for you, instead of requiring you to make mapping choices for all these functions? First, you may not need or be interested in using every last function, but just the ones that are important to your work. Second, you may have experience with other editors, and you probably would rather have your keys do what you want them to, instead of having SPFLite make those choices. As well, your physical keyboard may dictate some choices. a full 104 key keyboard has many more keys available over a laptop keyboard. What works well on a laptop would simply be ignoring the 17 keys available in the keypad of the 104 key keyboard, not taking advantage of those keys wold be a real shame. Throughout this Help, you will find suggested mappings for various commands and functions, which have been found to be useful. You are free to use these suggested mappings, or pick your own. All alphabetic and numeric keys operate as normal. Page Up / Page Down keys by are mapped to generate the UP and DOWN commands.